Not being a registered plumber, or even someone who would try to work with pipes and fittings, all I can do is read the relevant national standards when I want to check the legality of fixtures and fittings. Not that the owner of the property cares. Pipes and fittings have been cobbled together over time, and there have been plenty of leaks: half a dozen in as many months that we are aware of. Mind you he wasn’t the owner when the place was built, and his talents don’t rate anywhere in the handyman stakes. But my stance is that instead of hiring the cheapest “plumber” to repair problems, why not get it done properly? That way the problems SHOULD recur less often. I am at a disadvantage though, simply because I am currently not the homeowner in my place of residence. If I demand that the landlord repairs plumbing and other faults (for which he is legally liable), I cannot demand who does the job. Of course, not being the owner, I am not about to incur building costs that I am not liable for. The most recent leak was, as described in my previous post, under one of our baths. 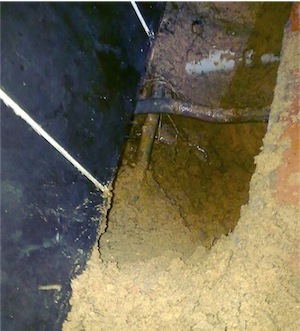 The trusty plumber who repaired two of the previous six leaks (we were able to remedy the others) was “too expensive”. But then he doesn’t know the layout of the internal pipes, and envisaged the repair would involve lifting the bath. In hindsight I should have identified the fact that there is more of a known history in terms of the horrendous pipework on this property. It has nothing to do with building design, building methods or business ethics, building plans, building regulation requirements, or anything else that immediately comes to mind. 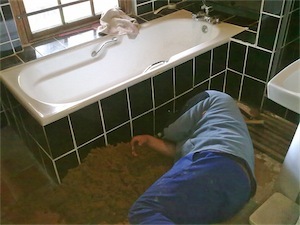 The property owner’s “plumber” of choice, it seems, knows the pipes and fittings like the back of his hand. He’s been there, got the T-shirt (in fact several it seems) and, on this occasion, was able to smile with pride as he smashed through the floor with a four-pound hammer… to reveal the evil leak, which was even worse than we had imagined. The water was pouring out when he opened up the pipework. A quick chop on either side of the hole, a short length of new copper pipe and two new fittings, and the job was done. But the question is, does the repair meet the relevant building laws and regulations? One thing I am sure about is that the pipes and fittings in place are dodgy. SANS 10252-1: 2004 Edition 2, amendment 1 (which is the South African National Standard for Water supply and drainage for buildings) states that unless the water is suitably treated, “copper piping shall not be used where the water can so dissolve an undue amount of copper that an unacceptable green staining is produced”. Well, our white acrylic bath in the adjoining bathroom is constantly turning a pretty shade of green-blue. And since the water is sourced from a borehole, there isn’t anything that can be easily done to treat the water before it heads for the copper pipes. Then there’s the question of the floor slab. Since the allocated plumber was not hired to replace the two floor tiles he had smashed, I was able to measure the depth of the concrete slab – out of academic interest, just because I could. b) a concrete slab which shall have a compressive strength of not less than 10MPa at 28 days, or be mixed in the proportions by volume of 1 part cement, 4 parts sand and 5 parts coarse aggregate, and the thickness of such slab shall be not less than 75 mm. Hmm. The floor is tiled with a quarry tile that is less than 20 mm thick, and the thickness of the slab PLUS the tile is less than 70 mm! Say no more! Hi if I had a unqualified plumber do all the pipes at my house,is that wrong?i have paid him but whos fault is it if its not done properly?? Lou you are both at fault. He is acting fraudulently, and you are responsible for having work done to standard. Hi, I’ve been following your thread and am dying to know what happened next! Matthew this particular leak didn’t recur, though the plumbing problems in general continued. In a later tale, I talked about another leak. The next saga, which I haven’t talked about involved me nearly falling into a poorly covered cesspit. 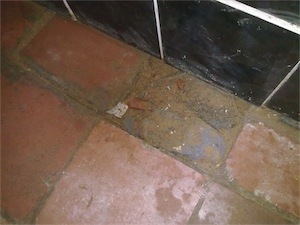 It had been covered with a wire grid (which didn’t cover the whole surface area) and plywood, which eventually rotted. Fortunately all I got was a bruise and a smelly, wet foot. Can you imagine if I had fallen in totally!? Disgusting that people can get away with illegal work like this. It is a health hazard. I will probably write a post on the incident soon. I found the information on this site handy.